For brick, stone, and concrete surfaces, exposure to moisture can be damaging, if not immediately then gradually and inevitably. Fortunately, it's easy to protect masonry surfaces—and the interior of your home—with a waterproofing treatment from DRYLOK. Here's how. For the last 50 years or so, new home foundations have almost always been made of concrete. Ranking among the toughest materials on the planet, concrete boasts surpassing strength and durability. It’s also cost-effective and, for the average contracting crew, relatively easy to work with. Considering its many virtues, there’s little wonder that in the construction of my own home four years ago, the builders saw fit to erect the wood frame over a foundation of poured concrete. Though it’s long-lasting and hard-wearing, concrete is far from invincible. It’s naturally porous, and that means it’s susceptible to moisture. If exposed to enough moisture for a long enough period of time, a concrete foundation can leave a home vulnerable not only to damaging leaks, but also to unhealthy mold and mildew. In severe cases, compromised concrete at the foundation level can even upset the overall structural integrity of the home, necessitating extensive, expensive repairs. That’s why, prior to backfilling around the foundation, the builders took a precautionary step. They waterproofed the concrete walls that would face below-grade soil—and any groundwater it might contain. The builders did not, however, waterproof the garage. Its foundation walls sit above ground; here, groundwater obviously wouldn’t be a factor. That all made sense to me at the time. But I was new to the area and didn’t know what to expect. It took only a couple of months before I became fully aware of what would be a defining feature of life here on the Delaware coast. Only two miles from the ocean, our property lies on flat, treeless land that once belonged to a large, old farm. The upshot is that in foul weather a flabbergasting amount of wind-driven rain strikes the side of our house—and, yes, the unprotected foundation walls of our garage. Eventually, as a hedge against water damage, we decided to waterproof the interior. Of the options available, we settled on DRYLOK Masonry Waterproofer for a few reasons. First, it’s versatile: It goes on either exterior or interior masonry walls and can even serve as a vapor barrier under adhesive floors (we’ll have to remember that for our upcoming basement finishing project). Second, besides resisting hydrostatic pressure, it also withstands driving rain up to 98 miles per hour. Guaranteed for 10 years, the product often lasts longer, assuming proper application. Working with DRYLOK Masonry Waterproofer couldn’t be much easier. Low-odor and fast-drying, the latex base ensures that the product cleans up easily with warm, soapy water. Once it has cured, the waterproof coating resolves to a high-gloss finish that’s easy to clean, if necessary. 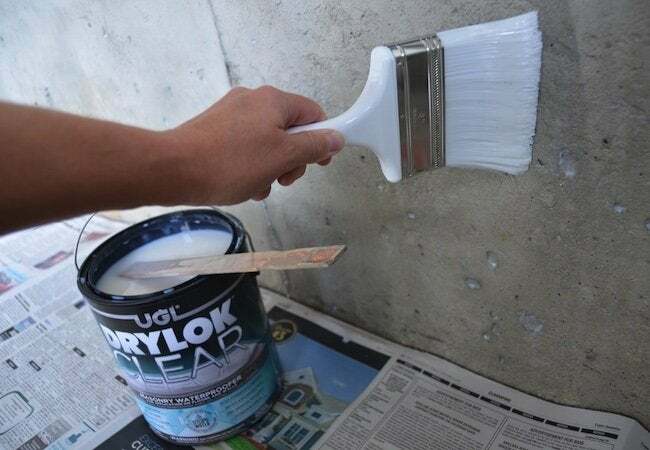 For the average, reasonably handy homeowner, applying DRYLOK differs only slightly from painting a wall. It took me just three simple steps to complete the entire process. Here’s how I did it. Before beginning the project in earnest, I made sure to open the garage door, as the product label indicates the necessity of adequate ventilation. From there, I proceeded to clear the area. Next, with no obstructions in my way, I thoroughly cleaned the concrete surfaces to which I would apply the waterproofing treatment. Once the garage walls had dried out completely—and once I’d confirmed that the temperature was above 50 degrees Fahrenheit (again, as stipulated by the instructions), I moved on to the next step. Note that one gallon of DRYLOK Masonry Waterproofer is enough to cover 75 to 100 square feet of surface area with two coats. Having prepared the surface, I gave the DRYLOK Masonry Waterproofer a good stir, just as I would have with paint. Then I began applying the coating with a regular nylon-bristle brush. (For a larger expanse of concrete, I might have opted for a roller with a 3/8″ nap.) Though the product looked milky in the can—and still a bit milky upon initial application—it became transparent as it dried. 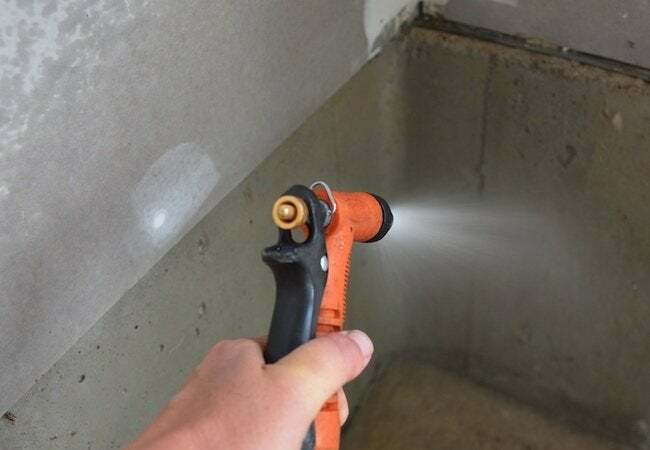 One thing to remember in applying such a product to concrete: Unlike drywall, concrete tends to be uneven, with pits and pores embedded in its surface. For that reason, put care into your strokes, making sure to fill every crack and crevice in the masonry. I continued brushing on the treatment until I had covered all the garage foundation walls with a continuous base layer. Then I waited. 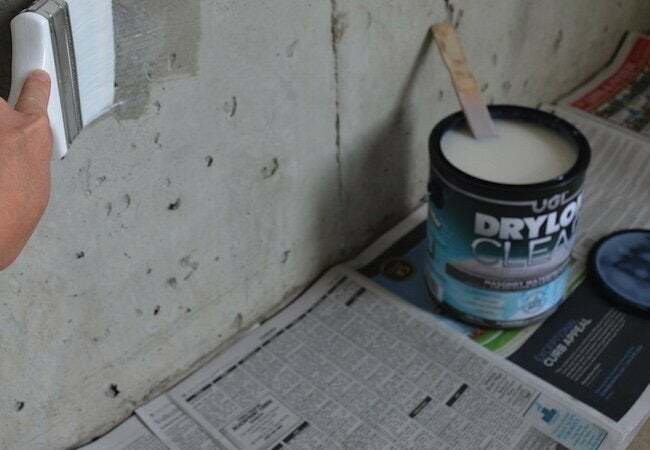 Just as with a thorough paint job, proper application of DRYLOK Masonry Waterproofer requires two coats. Dry times vary based on temperature and humidity, but it typically takes at least four hours for the product to dry. Once I was sure that the initial application had cured, I followed up with a second coat, applying it just as I had applied the first. Before calling it a day, I finished up by closely inspecting the walls, making certain to coat all the little pinholes that I had missed earlier. 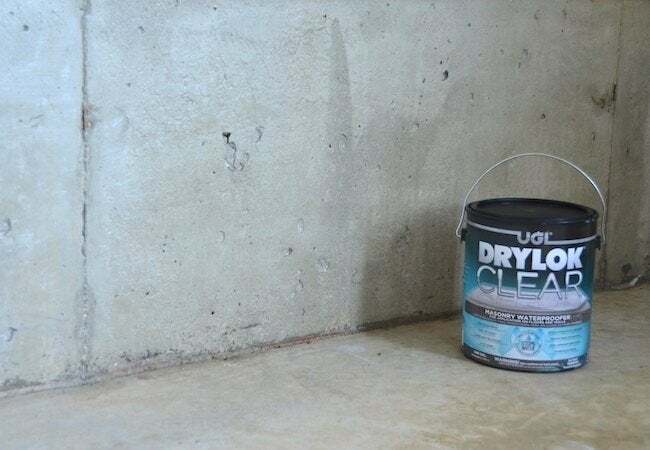 For my project, I chose a clear formulation of DRYLOK Masonry Waterproofer, because my sole intent was to prevent the incursion of storm water into my garage. Given my objective, I was happy to see that once the second coat had dried, the treatment was completely invisible, apart from its sheen. If I had, however, wanted to introduce a design dimension to the upgrade, I could have easily done so. That’s because DRYLOK offers a suite of waterproofing products, several of which are available in a variety of non-clear finishes. For instance, DRYLOK Masonry Waterproofer is tintable, in addition to coming in a number of ready-mixed colors, enabling you to waterproof a masonry wall—indoors or out—and transform its visual appearance at the same time. DRYLOK Extreme waterproofer is also tintable, permitting decorative flexibility even in demanding applications. Finally, the Designer DRYLOK line includes an array of unique speckled finishes that masterfully conceal damaged exterior surfaces. These give you the power to boost the curb appeal of your home and protect it from moisture damage, all in one fell swoop. I cherish the peace of mind that accompanies knowing that even if the wind blows hard, the masonry walls of our garage are bound to stay dry. Bring on the rain!